Podcast 274: Ove Logmansbo, Revealed! Heri Simonsen (left) interviews "Ove Logmansbo"
Last November, we discussed the curious case of Ove Logmansbo. He claimed to be a half-Polish, half-Faroese author who set a trio of crime novels in his "native" Faroe Islands. The books, written in Polish, contained some serious factual errors that suggested Ove wasn't who he said he was and that he may not have ever been to the Faroes. This week, it was revealed that Ove Logmansbo is actually Remigiusz Mroz, a famous Polish author who has written 30 books. And yes, he had never been to the Faroes before writing his three Ove Logmansbo books. But he made his first trip to the Faroe Islands this week, and it did not go as planned. 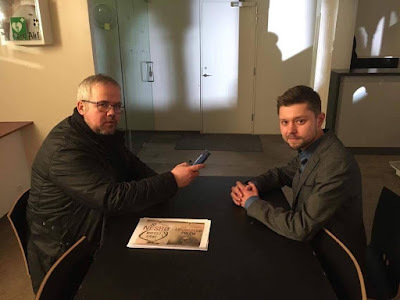 On our show, Heri Simonsen confronts Remi (in a polite Faroese way) about the inaccuracies in his books and the errors in how he portrayed the Faroe Islands and Faroese people. Then Heri and Matthew Workman talk about Remi's answers and the limits of fiction set in a real place. We end with original music from Bryn Lidel. He's a musician from Portland, Oregon who wrote a song inspired by the Faroes. As always, you can listen on iTunes, on our media player or on Stitcher Smart Radio. You can also download the show directly here.